23 Customers who ordered this rated it a 5.0 on a 1-5 scale. Read their reviews! So light and soft, you'll fall in love with this t-shirt right away. The ultra-light cotton jersey construction feels fantastic next to your skin and drapes beautifully. The SL04 has a sleek, contoured fit with side seams that will flatter your silhouette. To top off this tagless tee, it has been preshrunk to ensure a great fit after washing. Coordinates with Hanes 4980 4.5 oz T-shirt. Was very Easy to design online, ordering was quick and items arrived in time expected and were just like i ordered!! :-) Items were also VERY soft and colors were perfect! The shirt came out perfectly, exactly what i wanted! It was perfect size for a female who is size x-small/small in shirts. Loved the fit, wish it was a little less flimsy. The only thing that could make this better is if it were tagless. It is very soft, which is important to me. This shirt wasn't for me so I did not try it on, but the look and quality are nice and soft. Great shirt for the ladies, runs a bit small though so be careful when ordering! 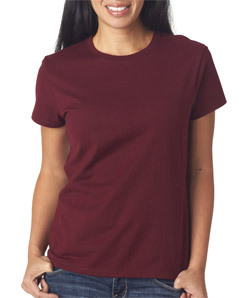 This year the Women's Hanes shirt was different and thinner than previous years.